When thinking about mouthwatering dishes, top quality ingredients and rich culinary tradition, rarely anyone would ever think of England. In recent years, however, the country saw not only several of its best chefs rise to fame, but also noted a growing interest in the traditional produce and dishes that have been fashioning English tastes for centuries, before they were overpowered by foreign products and cuisines that have spread over England. Join us on a culinary tour of England – the feast has just begun! England boasts a large number of local products that fortunately include all kinds of seafood dishes prepared in coastal locations. 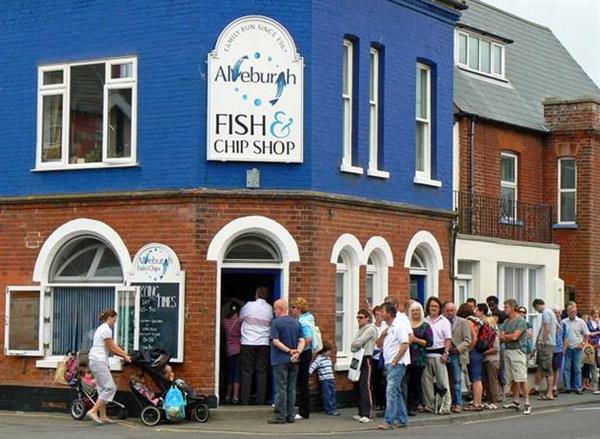 For all enthusiasts of the classic English fish and chips – head straight to Aldeburgh in Suffolk, which will greet you with a gold-encrusted flaky white fish, topped with some fresh chips doused in salt and vinegar. Seafood lovers will also find solace at the town of Scarborough, with its fresh fish and seafood brought straight from the market to our plate, or in the market of Portsmouth, where we can sample some delicious fresh oysters. Dairy products play many roles in English cuisine. For some freshly made ice-cream, it’s best to visit Southwell in Nottinghamshire. For something really special, however, head straight to Derby, where they serve fresh pyclets made from local milk. Travel to Cumbria’s Thornby Moore Cheese Dairy Company to sample some of England’s finest cheese, and visit Colston Basset Dairy in Nottinghamshire to understand what ‘smelly cheese’ really means. All cheese enthusiasts should also consider the Lancashire Cheese Trail, where you can get a glimpse into the cheese making procedure at Dewlay Cheese. All chocolate lovers will be delighted to know that England boasts a place much in the style of Charlie’s Chocolate Factory – the Cadbury World, literally a mecca for all chocoholics, counting half a million visitors each year. To continue the subject, if you’re a true chocolate fan, you simply must visit York, a city of long history with the delicious cocoa bean that dates back to the 18th c. For something typically English, try the famous Bakewell Tart, sometimes called Bakewell Pudding, which consists of smooth almond and jam filling enveloped in a light puff pastry. Delicious! Historically, England might be associated with terrible culinary creations (nothing tops the Victorian Brussels sprouts pyramid), but when it comes to beers and ales it’s nothing but a history of success. There are dozens of independent breweries scattered around England, so take your pick: a picturesque glass of beer in the heart of Chilterns or a fresh cider from the Moorhampton Park Farm? Don’t forget about the traditional English pubs, stocked full with some exclusive beer brands. Those to consider are Nottingham’s Ye Olde Trip to Jerusalem, supposedly the oldest pub in Britain, and London’s The Royal Oak, situated nearby the fictional Tabard Inn of Chaucer’s Canterbury Tales. Among some of the best shopping experiences in England are its vast and varied markets. Coastline areas are full of the freshest seafood possible, most famously at the Newquay or Portsmouth Fish Market. For some alternative markets, check Isle of Wight’s peculiar Garlic Festival or the exotic Thai Festival held in Bristol. Markets is where you get the most of England’s local produce, so don’t miss out on shopping at the famous Greenwich or Borough Market, but, if you’re very hungry, head straight to Oxford’s Foodies Festival, a real treat for all foodies alike. About author: Sophia is an experienced traveller and an expert on British history and customs. Currently, she writes articles for sevenspots.co.uk, a website gathering all the interesting places in England. My cousin visits England often for business, and swears by North Bay Fisheries in Scarborough. It isn’t a sit down restaurant, they only have tables outside. The fish is made fresh to order with great chips, (fries), and as long as you manage to make sure both items are drained of as much excess oil as possible, are the best fish n chips in England.